Imagine finding maggots in your children’s half eaten take-away hamburgers from a fast food chain. Or losing a loved one, killed on a construction site while working for a large building company. Or the devastating impact from an accidental release of highly toxic emissions by an international chemical manufacturer in your local neighbourhood. In all of the above scenarios we have specific laws designed both to prevent, and to provide effective penalties to deter the producers and operators from risking the health and safety of the community and the environment. Similar laws provide compensation to those injured or damaged by the failure to protect the public, workers and the environment. Over time, these laws come to reflect the prevailing attitudes and norms of society. The common law on negligence has established the concept of a ‘duty of care’ on those whose actions or inactions may reasonably and foreseeably cause damage to others. It’s up to the state to prescribe the level of duty required to be exercised, liability and the excuses the injurer may rely upon to defeat a prosecution or damages claim. It is a contested dynamic field involving political intervention to establish legal benchmarks. And in this sense, the level of protection afforded communities and the environment compared with the industry, is not so much about the pluralist ideal of ‘balancing the interests’ of competing stakeholders with ultimate common goals on the scales of justice. Rather, it has more to do in the real world with the capacity of the major players to unduly influence governments to pass laws and apply regulations and compliance standards in their unequivocal favour. Society rightly places a very high premium on human life, especially the most innocent and vulnerable. This is usually reflected in the level of corporate responsibility, due diligence and care required by the industry as prescribed in public interest and safety laws. But when it comes to the regulation of alcohol in NSW, there is a significant mismatch between the burden of harms including Fetal Alcohol Spectrum Disorders (FASD) associated with the sale, promotion and consumption of alcohol, and the legal duties (including preventing violence and intoxication) imposed on those who profit from its availability and over supply, particularly at the corporate level. Just 20% of drinkers consume around 75% of all alcohol sold. As outrageous as this may sound, these are the very same weak excuses, being successfully used by the alcohol industry in NSW. They were common to many of the alcohol industry submissions the NSW government recently relied upon to significantly reduce the regulatory ‘burden’ on corporate pub and nightclub owners under the Three Strike laws. Under draconian NSW alcohol laws forever moving towards greater industry self-regulation, size does matter (s144(2)(c )(ii)). The bar of legal responsibility and duty of care for alcohol outlet owners has been lowered in comparison to other similar providers of risky commodities, services and workplaces. The recently watered down Three Strikes law has always required the decision maker to take into account the size of the premise before issuing a strike. This has enabled some of the consistently most violent licensed premises in NSW like the Ivy nightclub that has been listed as ‘violent’ 16 out of the last 17 overlapping rounds and current number ‘1’ with 36 reported assaults in 2016, never to receive a strike or associated prerequisite successful prosecution. It’s time the government told the Ivy its ‘reasonable measures’ to prevent violence and intoxication simply aren’t good enough. The Sydney Junction Hotel in Hamilton was recently identified as the equal third most violent pub in NSW. Its well organised publicity response relied upon the very excuse that the number of assaults was low when compared with their number of patrons. Mindless of the additional income generated by more patrons, the same excuse ignored that the level of reported assaults on premises are just the tip of the iceberg of violent and related incidents linked to their intoxicated patrons once they leave. BOCSAR identified the majority of assaults linked to a premise occur outside but are not included in the violent premise list scheme. 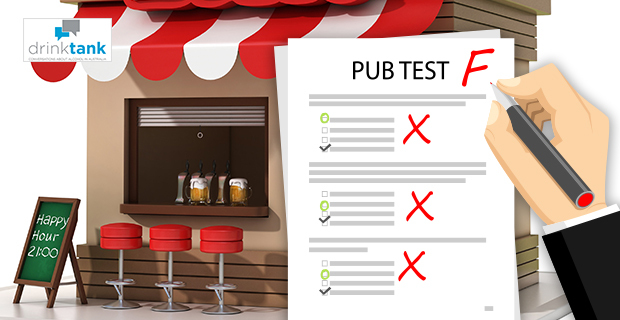 In an extraordinary concession, the powerful alcohol industry persuaded the NSW government to no longer issue strikes against the owners of pubs and nightclubs, contrary to the recommendations of the internal review conducted by Liquor & Gaming, NSW. And it has now come out that findings of the Three Strikes scheme were kept hidden by NSW ministers for a year. The liquor lords demanded and won that they should not be vicariously liable for the mistakes of their employees. Employed licencees will be the expendable fall-guys who will from now on receive a strike. These continuing and pathetic industry excuses for unacceptable violence don’t pass the pub test. As most of the alcohol sold is now from large discount bottle shops, those who ‘guarantee’ the lowest prices for unlimited volumes of grog must also share some legal and moral responsibility and costs for our intractable levels of alcohol fuelled family/domestic violence. It all comes back to political leaders of all parties who benefit. A version of Tony Brown’s article was also published in the Newcastle Herald on Friday 16 June, 2017. Read the article here. The alcohol industry in NSW is amongst the most influential lobby groups at a state level. Now that the big retailers have become hugely successful packaged liquor players, the stakes are higher than ever. The well-oiled PR machines that promote the interests of the liquor sector will stop at nothing to prevent the overdue national conversation about alcohol related harm. The 2019 Federal Budget gave nothing but scraps to worthwhile public health initiatives and the picture is particularly grim for those looking to prevent alcohol harm.